Gov. John Kitzhaber has made economic, education and healthcare issues a priority in the most recent of his three non-consecutive terms as Oregon Governor. An emergency room doctor by trade, Kitzhaber also served in the Oregon House of Representatives and Oregon Senate. In addition to his political tenure, Kitzhaber has also led a number of health related organizations including the Center for Evidence Based Policy at the Oregon Health & Science University, the Foundation for Medical Excellence, the Estes Park Institute, and health care advocacy group the Archimedes Movement. This fall, he faces challengers from the Republican, Green, Constitution, and Libertarian parties. 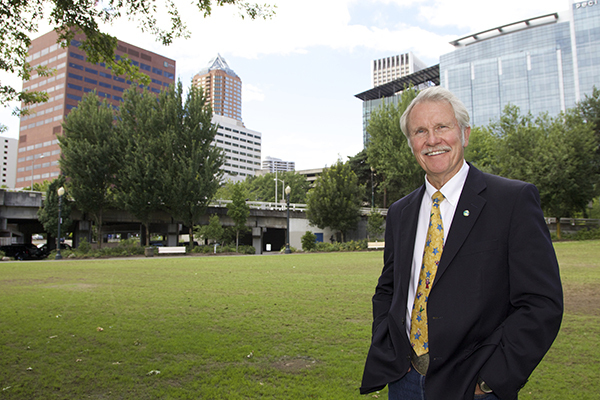 John Kitzhaber: The political bug bit me in 1968 during Bobby Kennedy’s last campaign. It was a campaign about equity and opportunity; about poverty and children starving in the Mississippi Delta and on the Pine Ridge Indian Reservation in the wealthiest nation in the world. It was a campaign that asked profound and sometimes disturbing questions about who we were as Americans, about our values and how we wanted to treat one another. It was this last campaign—which lasted only 82 days from his announcement until his assassination in Los Angeles—that inspired me and motivated me to commit most of my adult life to public service. Throughout all my years representing Roseburg in the Legislature and as Governor, my commitment and motivation have not changed. I’m committed to rebuilding a strong, secure middle class and ensuring equity and opportunity for all, with quality jobs and upward income mobility. JK: Bobby Kennedy, Winston Churchill and Teddy Roosevelt. JK: Since I took office we’ve added over 100,000 jobs, lowered the unemployment rate by three points and, even more importantly, we’re working to create the right kind of jobs: full-time with benefits instead of part-time with none. I also want to continue the important reforms to our education and healthcare system that are improving outcomes for students and patients. SW: What are you doing right now in service of the issues you‘re most passionate about? JK: We have finally been able to reinvest in our schools so that districts across Oregon are hiring teachers, lowering class sizes and restoring lost school days. We’ve also frozen university and college tuition for the first time in 14 years and our Coordinated Care Organizations are saving millions by reducing costly emergency room visits and boosting preventive care. We’re also working with small business owners and others to clear hurdles for investment throughout Oregon—particularly through my regional solutions teams. Unemployment is down more than three percentage points and the number of Oregonians who say they are underemployed is dropping. JK: My demographic is Oregon, pure and simple. I ran in 2010 because we had become divided as a state, with politics pitting one group against another. Over the last three and a half years, I’ve worked to bridge those political divisions. Oregon won’t be a good place for any of us to live unless it’s a great place for all of us to live, and I want to bring Oregonians together to unite behind our common shared vision. SW: What steps would you take as Governor to strengthen Central Oregon‘s economy? JK: We’ve had great success in Central Oregon helping Apple and Facebook build new data centers in Prineville and in 2012, the Central Oregon Truck Company built a new headquarters in Redmond, retaining 125 jobs there for Oregonians. The OSU Cascades campus is also a great economic boost to the area. Over the next four years I want to expand on that success. Our regional solutions teams are working with local leaders to outline priorities for economic development and Central Oregon has a lot of great opportunities ahead. SW: Where is your primary financial support coming from? Can you name three groups you wouldn‘t accept money from? JK: Oregonians, from up and down the I-5 corridor, out to central and eastern Oregon and across industry and agriculture sectors—support for my campaign is coming from across the state. I will not accept money from tobacco companies or Oregon Right to Life. SW: What‘s your stance on religious exemptions, such as those permitted by the Hobby Lobby case? JK: I believe the Hobby Lobby decision is the wrong direction for women’s health. Bosses shouldn’t be interfering with their employees’ decisions to use birth control. SW: What‘s your position on the legalization of marijuana, GMO labeling, and top-two primaries? JK: While I have reservations about the legalization of marijuana and won’t be voting for the legalization ballot measure, I believe legalization is inevitable. On GMO, we have a real conflict in Oregon between GMO and non-GMO growers and the labeling measure wouldn’t solve that, which I think is an important trade issue. That said, I think consumers deserve to know what’s in their food and will vote for that measure. I’m also supporting the top-two primary measure. JK: Honesty, compassion and sharing Oregon values. JK: The endorsements I have received speak volumes about the differences in our values, I am proud to have been endorsed by: Oregon Business Association, Oregon League of Conservation Voters, Sierra Club, SEIU 503 & 49, Oregon Nurses Association, Oregon AFL-CIO, American Federation of Teachers-Oregon (AFT-Oregon), Oregon AFSCME, Oregon State Building and Construction Trades Council, Basic Rights Oregon Equality PAC, Oregon State Council for Retired Citizens, Planned Parenthood PAC, NARAL Pro-Choice Oregon PAC, PCUN, and Oregon End Violence Against Women PAC. SW: What are your opponents‘ best qualities? JK: My opponent has a deep commitment to family, as do I.